The Nevada Advance Directrive Registry is a secure, password protected database which stores Living Wills/Durable Powers of Attorney for Health Care Decisions (advance directives) in a common web-based location by the Nevada Secretary of State. Access to the documents is restricted to the person filing, others authorized by that person, and authorized health care providers. Use of the Living Will Lockbox is free to all Nevadans, and registering is very simple. By visiting ​Nevada's Advance Directive Registry, Nevadans can download the registration forms, then send the completed forms and the documents to be filed to the Nevada Secretary of State. They will then receive a wallet-size card with their password for accessing their advance directives. Changes to the documents may be made at any time through a simple procedure similar to the registration process. Get your life organized with the best workbook available! Paperwork, personal information, and passwords aren’t always easy to find, and organizing your records can seem like an intimidating task. But, whether you need to get a handle on records for yourself, your family or your executor, Get It Together will show you how to organize: (1) instructions for survivors; (2) secured places and passwords; (3) estate planning documents; (4) funeral arrangements; (5) employment records; (6) insurance policies; (7) tax records; (8) retirement accounts; (9) government benefits; (10) real estate records; (11) and more. 1. Securely store an unlimited number of passwords while keeping them handy. 2. Decide whether you want to record your information electronically or by hand. 3. Choose the way you want to organize your passwords―for example, alphabetically or by type of product or service. 4. Easily add related notes, such as security questions. 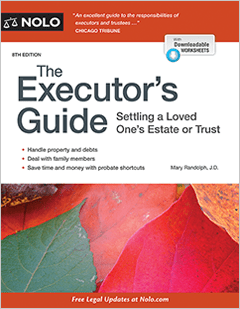 Settle an estate or trust with this all-in-one Executor's Guide.